Air remaining trapped inside your home rather than being able to escape outside is one of the best ways to save energy, as it helps reduce the amount of time your heater or air conditioning has to run. Insulation does a huge part in keeping air in to circulate properly, but even if it's in the best possible shape you may still have leaks thanks to cracks or spaces in the attic. These things occur over time with wear and tear, may be caused by rodents, or might be due to manufacturer error. An attic air sealing takes care of that problem by closing up the leaks and creating an airtight seal! That way, your home will be able to maintain a comfortable temperature without having to run those systems for longer than necessary and waste a lot of energy in the process. As mentioned previously, keeping your home's attic airtight helps hugely when it comes to saving energy, which will assuredly save you money in the long run. Even if just a little air is getting out, it will add up before you know it. If you've noticed that some rooms have trouble with regulating the temperature, it may have to do with the air escaping as well. Sealing everything up will help cut those costs and can help make your home more comfortable overall. Our experts would be happy to come out whenever is best for you and get to work with our high-quality equipment to assure a job that's done right and quickly as well! We'll test to ensure that every single spot that's leaking air is found, then use a special expanding spray to completely fill up the cracks to make that seal and protect your home from any further leaking. It's time to reduce that nasty energy bill and save some money today! Just call Duct & Attic Experts Houston to set up your appointment now. You'll be glad you did! Air sealing is definitely worth the expense, especially if you live in a cold climate. Although the insulation of your attic reduces the heat transfer, it does not completely prevent the air flow. The insulation material covers the gaps and cracks in the walls and ceiling but can still allow for air leakage through the openings around the chimney, ducts, framing, and gaps around wires and pipes. Other under-insulated areas are found around the roof dormers and level changes. 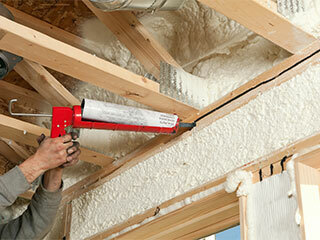 Air sealing the attic should be done by experienced professionals with the fit for purpose tools. The process usually includes a thorough inspection using a blower door to locate the leaks before making a final decision on which areas need sealing.